This Lent has been particularly revealing for me. This being my third year going through Lent as a Confessional Lutheran, I've learned quite a few things about myself. Come to think of it, these are things I probably instinctively already knew about myself, but didn't want to admit let alone reveal for all the world to see. Of course, as each and every person reading this knows, God's Word has a way of making sure you can't hide your sins from yourself or others forever, and they are never hidden from the Lord anyway. For me, it's always at the precise moment when I start to think to myself, "Great job, Jeff! You've been doing a really good job at this 'Being A Christian' thing! Plus, you haven't committed sins X, Y, and Z for such a long time too! Man, good for you!" that I'm exposed to a passage from the Word of God that strips me bare and exposes me to myself to reveal just how ugly and sinful I still am without even realizing it! It can be a very troubling experience too! You go from the highest high to the lowest low in the blink of an eye and Satan is more than ready, willing, and able to help you by not helping you. All too often the holy saints and apostles are portrayed only as absolutely superior human beings. They surmounted every difficulty, blazed trails, sacrificed themselves, followed their Lord, and were often martyred for the holy faith. Who wouldn't want to emulate such persons? However, wanting to emulate them and being able to do so are two very different things. We are plagued by the weakness of our sinful flesh. We struggle to believe our Lord as we ought. We flounder about in the garbage of daily living. We seldom follow the exalted example of the saints and apostles often set before us. However, we have failed to understand properly the true meaning of their example. They are not spiritual Supermen. None of them wore a big "S" on their chests. On the contrary, their example also includes weaknesses just like ours, their struggles to confess faithfully the name of our Lord Jesus Christ, their imperfection, and their sin. They are called saints not for their own sakes, but for the sake of the blood-bought righteousness of Jesus Christ. They are sinners like us made holy by holy blood. When our conscience is troubled by our struggles and weaknesses we should turn our eyes upon the weakness of saints like Peter, who on the one hand faithfully confessed that Jesus is the Christ and yet on the other was brutally rebuked by his Lord. Saintliness is not a matter of my obedience to the example of the saints, but faithful listening to the sweet consolations of the Word of God. We are super saints because we have a super Lord! So true and so comforting! Take note, then, all you who have a timid conscience. You will not be saved by this or that work. For it will fare with you as with one who works in a sandpit: the more sand he shovels out the more falls upon him. That's why many have gone mad, as John Gerson says, so that they began to imagine things, one that he was a worm, another that he was a mouse, and so on. Just commit it to God and say: "Oh, my dear God, I have sinned, but I confess it to thee, I pour it out to thee and pray thee for help; do thou help me!" This is what God wants of us. That's why I should like sermons about the saints to be more moderate in the sense that we would also tell how they fell, in accord with the gospel....For there can be no doubt that they too tripped and stumbled over great humps. They were of one flesh with us, one faith, one baptism, one blood. But we have now set them so high above us that we must despair of imitating them. Thus, for example, the gospel speaks of Peter after his confession concerning Christ, when he said to him, "You are the Christ, the Son of the living God" (Matthew 16:16). But soon afterwards he had to take these words: "Get behind me, Satan, you devil!" (Matthew 16:23) whereas just a while before he had been told, "Blessed are you, Simon Bar-Jona!" (Matthew 16:17). Just look; first he is blessed and holy, and afterwards he topples into hell and is called a devil. So it is that every one of us by himself is a devil, but in Christ we are holy. So when we thus connect the saints with Christ, they are Christ's true saints; but if we are not to despair, we must follow him. This Gospel lesson (John 11:1-45) therefore expresses nothing but the sweetness of Christ in His obedience to the Father and that He bestows nothing because of merit. Therefore, when the devil assaults us with temptation, you say this: "Ah, even though I have done nothing that is good, nevertheless I will not despair, for He always dealt with men sweetly," and that is true. Only the damned must remain until they have paid the last penny (Matthew 5:26). The Scriptures demonstrate this again and again. In Ecclesiasticus it is written, "Who was ever forsaken by God? "...And to Jeremiah God says, "Behold, I will fulfill my words against this city for harm and not for good, and they shall be accomplished before you on that day. But I will deliver you on that day, declares the LORD, and you shall not be given into the hand of the men of whom you are afraid. For I will surely save you" (Jeremiah 39:16-18). From this we should learn how Christ loves us, even though He might justly be angry, in order that we should also love our brethren. Look, this is the way God treats you! Certainly, it's incredibly comforting and helpful to know that our lives as Christians aren't a "complete failure" if they don't somehow emulate the lives of the Apostles. Sadly, there are far too many Christians who will try to tell you otherwise (I know a few of them myself!). Nothing could be further from the Biblical truth though! All that does is burden us under the weight of more of the Law and it can have a ripple effect too as the feelings of guilt and unworthiness can then immobilize us to the point where we get the Doctrine of Vocation all wrong, or worse, ignore it completely. It is true that the church is full of people who believe one thing and do another. I do it every day. That is a proper definition of what a hypocrite is. I confess that I am a hypocrite. Try though I might, I never live up to the high standard that my Lord holds for His children. I never believe boldly enough His grace. I still worry about things that He promises to take care of. I never live in the full freedom of a son of God. I am a hypocrite. 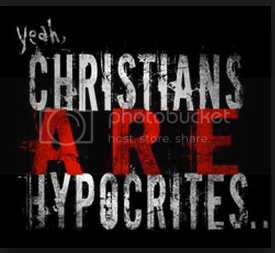 However, the hypocrisy of the church's children does not negate the holiness of the church. The church's holiness is dependent upon Christ and the gifts that He gives the church, not upon the church members. She is not her own holiness, Christ is (1 Corinthians 1:30). The church ever and always remains the community of sinners and troubled consciences, miserable hypocrites, and the brokenhearted. But when God bestows His righteousness through His holy Word, those troubled by their sins exchange their mourning for the oil of gladness and their despair for the garments of praise (Isaiah 61:3). Therefore, the church's holiness is not a matter of sight. What about Christianity is a matter of sight? Christianity is and remains until the Last Day a matter of faith. Christ makes this little holy band of Christendom holy by the power of His forgiving Word. He calls the whole world to His Christendom, "Oh, come and join. The church could use one more sinner. And there will be rejoicing in heaven!" Luther confesses this in his explanation to the Third Article of the Apostles' Creed, "the holy Christian church; the communion of saints." We are a community of holy hypocrites. Where does that leave us then? Does merely admitting that "we are a community of holy hypocrites" excuse us from any kind of responsibility let alone give us a license to sin? May it never be so! No, it simply gives us the proper perspective and should help lead us to the proper posture unto repentance, which should be a daily practice for each and every one of us given these realities. What I've learned about myself this Lent is chilling. You might think that's quite "melodramatic" and that I'm just trying to write an entertaining, powerful blog post with a statement like that, but isn't that how true sanctification is supposed to work? We've all heard other Christians say that the longer they live, and the more they mature in the faith, the more conscious they become of just how truly sinful they are, haven't we? It's that realization that feeds a deepening love for our Lord and Savior and His free gift of salvation for us. The Christian life is not easy. Martin Luther makes fun of the "plaster saints" of the medieval church, the saints set before the people as the perfect example for their piety. The plaster saints exhibited a perfect life and piety, as though it were as easy as falling out of bed. The saints were portrayed in such a way that they never struggled with sin or battled against their own flesh. They were masters of their own holiness. Like the plaster statuary to which Luther referred, they looked beautiful, were well painted, always exhibited a cherubic smile, and nothing bothered them. But if they fell from their perch of piety in some niche, they were smashed into a thousand pieces and were found to be completely hollow; unreal. Luther took pains to describe the saintly life in such a way that it was quite real. Saintliness is not an easy perfection. It is not a life free from sin. It is not a life into which no trouble comes. It is not a life of constant cherubic joy. It is a life that knows the meaning of sin and the redeeming blood of Jesus Christ. It is a life that recognizes, in the midst of trouble, the gift of Christ's cross and the suffering connected with it. It doesn't just put on happy face or merely look on the bright side of life. The Christian life may not be gauged by feelings or by external appearances. No, the Christian life can only be measured by the One who is source and strength: Christ Himself. The crucified and risen Lord is the One who defines what the Christian life is and what it looks like. This is why only those who are heartbroken and downtrodden have any need to approach the good Physician of the soul. The world can look at the Christian life and mock it and ridicule its weakness and dependence on God, but that is precisely the reason that it is certain and full of divine gifts. Only the weak and dependent will actually benefit from it. The world so mocked and ridiculed the Son of God upon the cross, but in His weakness there is our life. If He could be weak, giving Himself up for us all, and in that triumph, why should it be any different for us? Most of all, the saints feels their sins and the desires of the flesh that plague them because they are still in the world. There remains the daily battle to keep a stranglehold on old Adam. That isn't easy. He fights like the devil. This battle is fraught with tears, failure, and sorrow. Here is why the saints find themselves on their knees imploring the Lord for His grace. Here is why the saints demand to speak their sins in confession that the confessor can say them away in holy absolution. Here is why they do not fear the designation: "sinner." They do not fear such a name, because they have a Lord that is the friend of sinners (Luke 7:34). The saints are not free from sin, but free from condemnation, because they are in Christ Jesus (Romans 8:1). Real saints are real sinners. And that, my dear friends, is a proper distinction between Law and Gospel. It's why I am so thankful that by God's grace He has led me back to being a Lutheran. It is able to be understood who the true saints are. They are not stumps and stones, as the sophists and monks dream. They are not people who remain unaffected by anything or who never feel the desires of the flesh. But, as Paul says, the desires of their flesh are against the Spirit (Galatians 5:17). Therefore they have sin and are able to sin. Psalm 32 testifies that saints confess their own unrighteousness and pray for the forgiveness of the guilt of their sin when it says: "I said, 'I will confess my transgressions to the LORD,' and you forgave the iniquity of my sin. Therefore let everyone who is godly offer prayer to you" (Psalm 32:5-6). The whole church, which certainly is holy, prays that its sins be remitted; and it believes in the remission of sins. In Psalm 143 David prays: "Enter not into judgment with your servant, for no one living is righteous before you" (Psalm 143:2); and in Psalm 130: "If you, O LORD, should mark iniquities, O Lord, who could stand? But with you there is forgiveness" (Psalm 130:3-4). This is how the greatest saints speak and pray, David, Paul, etc. Therefore all saints speak and pray in the same spirit. The sophists do not read the Scriptures; or if they do read them, they read them with a veil drawn over their eyes (2 Corinthians 3:14). Therefore they are unable to come to a proper judgment about anything, neither about sin nor about holiness. Thanks be to God that I'm a saint thanks to His Son! In a Lutheran layman's terms, I'm a holy hypocrite, not some spiritual superman, because real saints are real sinners, and real sinners who confess their sins and repent of them will be forgiven and restored by Christ Himself. At the end of the day, I'm not free from sin, but free from condemnation, because I am in Christ Jesus (Romans 8:1)! As much as Lent has forced me to focus on my own life and my own sins, it's always ever only about Christ's life, Christ's death, and Christ's resurrection for me (and for you!) that matters more than any present day reality whether it's seen or unseen. NOTE: Please understand that I'm not a called and ordained minister of God's Word and Sacraments. I'm a layman or just a regular Christian, Executive Recruiter, Husband, Father, Friend who lives in the "City of Good Neighbors" here on the East Coast. To be more specific, and relevant to the point I want to make with this disclaimer/note, please understand that I'm also a newly converted Confessional Lutheran who recently escaped American Evangelicalism a little more than 2 years ago now. That being said, please contact me ASAP if you believe that any of my "old beliefs" seem to have crept their way into any of the material you see published here, and especially if any of the content is inconsistent with our Confessions and Lutheran doctrine (in other words, if it's not consistent with God's Word, which our Confessions merely summarize and repeatedly point us back to over and over again) so that I can correct those errors immediately and not lead any of His little ones astray (James 3:1). Also, please be aware that you might also discover that some of the earlier pieces I wrote for this blog back in 2013 definitely fall into that "Old Evangelical Adam" category since I was a "Lutheran-In-Name-Only" at the time and was completely oblivious to the fact that a Christian "Book of Concord" even existed (Small/Large Catechism? What's that!?!). This knowledge of the Lutheran basics was completely foreign to me even though I was baptized, confirmed, and married in an LCMS church! So, there are some entries that are a little "out there" so-to-speak since the subject matter was also heavy influenced by those old beliefs of mine. I know that now and I'm still learning. Anyway, I decided to leave those published posts up on this website and in cyberspace only because they are not blasphemous/heretical, because we now have this disclaimer, and only to demonstrate the continuing work of Christ and the Holy Spirit in my life (Hebrews 12:2; Philippians 1:6). Most importantly, please know that any time I engage in commenting on and/or interpreting a specific portion of the holy Scriptures, it will always closely follow the verse-by-verse notes from my Lutheran Study Bible and/or include references to the Book of Concord unless otherwise noted. Typically, I defer to what other Lutheran Pastors both past and present have already preached and taught about such passages since they are the called and ordained shepherds of our souls here on earth. Finally, I'm going to apologize ahead of time for the length of most entries (this disclaimer/note is a perfect example of what I mean! haha). I'm well aware that blogs should be short, sweet, and to the point, but I've never been one to follow the rules when it comes to writing. Besides, this website is more like a "Christian Dude's Diary" in the sense that everything I write about and share publicly isn't always what's "popular" or "#trending" at the time, but is instead all the things that I'm studying myself at the moment. For better or for worse, these posts tend to be much longer than most blog entries you'll find elsewhere only because I try to pack as much info as possible into a single piece so that I can refer to it again and again over time if I need to (and so that it can be a valuable resource for others -- if possible, a "One-Stop-Shop" of sorts). Thank you for stopping by and thank you in advance for your time, help, and understanding. Feel free to comment/email me at any time. Grace and peace to you and yours! Who Gets To Define Worship?